This post is republished from the So You Think You Can Write archives from 2016, written by former Presents Editorial Assistant, Grace Thiele. Hello! Before we embark on this adventure of romantic writing advice, I’d like to introduce myself. My name is Grace Thiele (pronounced Tea-Luh, thank you kindly), and I am the new Editorial Assistant at Harlequin Presents. As a true romance addict who looks for the love story in everybook, Harlequin has become home very quickly. While my heart belongs to Presents’ particular brand of seductive billionaires, since joining Harlequin’s London team I’ve fallen in love with doctors, dukes and debonair sheikhs: in this office, I’m never short of reading material! In my two-and-a-half months on the job, I have learnt many things about Harlequin – I’ve chatted to editors about many parts of a writer’s craft, be it dialogue, character development, plotting, settings and, most importantly, what makes a really great romantic ending. 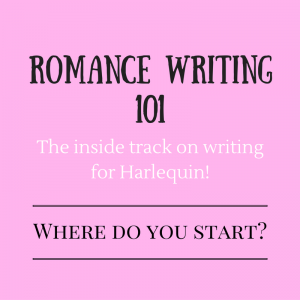 As a hobbyist writer who occasionally dips her toe into the mysterious pool of literary creativity, talking to editors about what they look for in a new Harlequin story is a fascinating learning experience. So! Consider me your insight into the secret ways of writing for Harlequin. In between booking meeting rooms, taking notes, doing mood-boards and endless reading (tough break, I know), I will be informing you with my advice on how to craft your own Harlequin story, taken from the talented editors I get to work with every day. So, how do you get your ideas together? Well, stories come together in many different ways, whether the first inspiration comes from a character, a potential plot point, or even a setting or hook. For some writers (myself included! ), character comes first. You might get inspiration from a newspaper article, fairy-tale or someone you know: I like to meet a character in my imagination, and then get to know them. Along the way they’ll tell me about their friends, their enemies, where they’ve been and what they’ve seen, and I start to build my story. But until I know that person, I can’t see the rest of the story! You might begin with imagining a moment: maybe a gorgeous dark-haired man in a tux and red-haired woman in a gown, arguing on a balcony. From there, your imagination can shoot off in a million different directions: Who are they? What are they arguing about? Where is this balcony – and why did the woman just throw her engagement ring over the edge of it?! From one great moment you can build everything else, from characterisation to plot to setting. One unique moment can be the beginning of a really great romance. On the other hand, one particular setting might inspire you – maybe you daydream of escaping to a castle in the Alps? Perfect! A great setting is sometimes the best way to root your story. For historical authors, a particular time and place might be the jumping-off point. I guess I’m saying that there are many different ways that an idea can start. Look out for them everywhere: you might walk past a stunning mansion or witness an interesting conversation – and then let your imagination run wild. Obviously, keep it romance focused, and think about your audience, but don’t hold your imagination back! Writing Challenge: What’s at stake? I enjoyed your exploration of how authors are inspired. I often draw inspiration from my travel experiences – people, places, stories. Travel features heavily in my writing, almost as another character, and often a place is the starting point for the story. I’ve lots of ideas filed away for subsequent books. I know that most (many) authors do. Sometimes I wish I could write them concurrently, but of course an author must choose which to ‘nuture’ next. Hi. How can I purchase Romance Writing 101:Where do you start?